Sheesh, what a summer. To any tourist who visited Sydney this summer and expected some nice weather: I’m sorry. Truly and deeply sorry. It is, of course, pouring rain right now. The 28-day weather outlook is: Rain. Every. Single. Day. And despite all this rain, the weather has finally warmed up. It was wet today, but also 30°C and sauna-like humidity. It felt like Bangkok, seriously. It’s thick, heavy, sticky, steamy, tropical rain that penetrates to the skin despite not even hitting you. It’s 8:30pm now, and I’m sitting here inside my home, and sweat is literally dripping down my face because it’s so damn humid. It’s supposed to be summer here, but you wouldn’t know it. 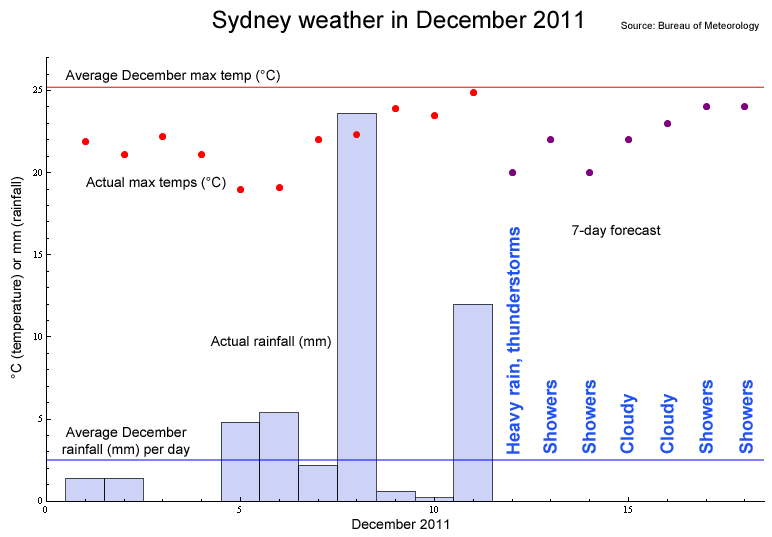 Here’s a graph of Sydney’s weather for December so far, including official observations and the current 7-day forecast.